The user drop-down menu is located at the top right corner next to the Advanced Search button. The menu is accessed by clicking on the button that displays the user’s name. The selections found in this drop-down menu are listed below. 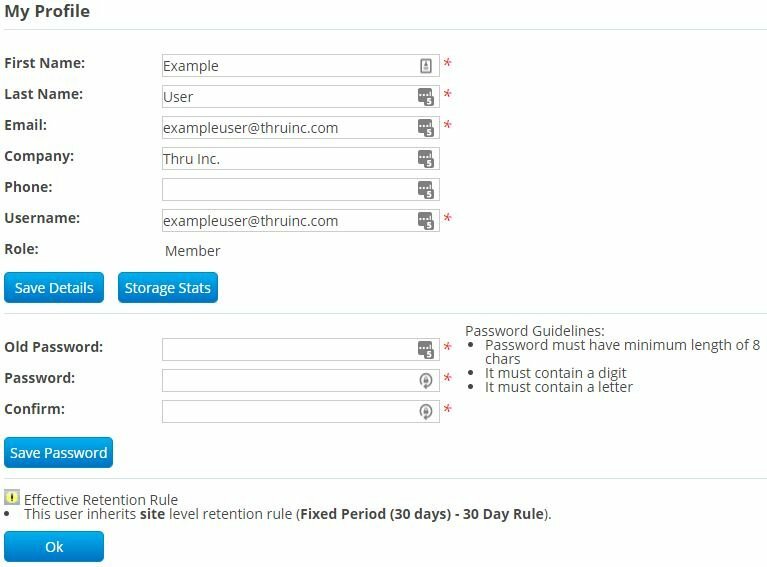 Selecting Administration switches the application from the standard User mode and gives administrators access to features such as Site Options, Group and User management, and much more. This selection displays a user’s account information where it may be modified when needed. Any time a field is changed such as a username or email, the Save Details button must be clicked before exiting the page or else all changes will be lost. Below the account information, users may change their password at any time. After changing the password, always remember to click Save Password or else the changes will be lost. Whenever users have questions about Thru Web features, this selection opens a window displaying general instructions about each section of the Thru Web. When in administration mode, the Help button will direct administrators to Thru’s Support and Sales teams. 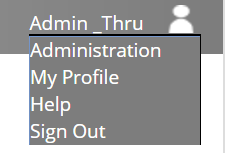 To sign out of a session, select Sign Out on the drop-down menu. This will terminate a session and direct the user back to the login page.